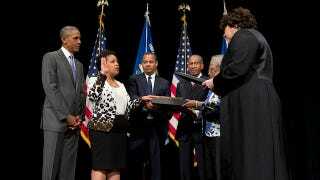 On Wednesday Lortetta Lynch was sworn in as 83rd Attorney General of the United States. She is the first black woman to hold the position. With the president, her husband and parents by her side, Lynch was installed by Justice Sonia Sotomayor. Lynch was finally confirmed on April 23rd following a nearly five month delay of Republicans fiddling their thumbs. Our new Attorney General was sworn in using a Bible belonging to Frederick Douglass. So, just to recap: We have a Latina Supreme Court Justice swearing in the first black female attorney general with a black abolitionist’s bible.